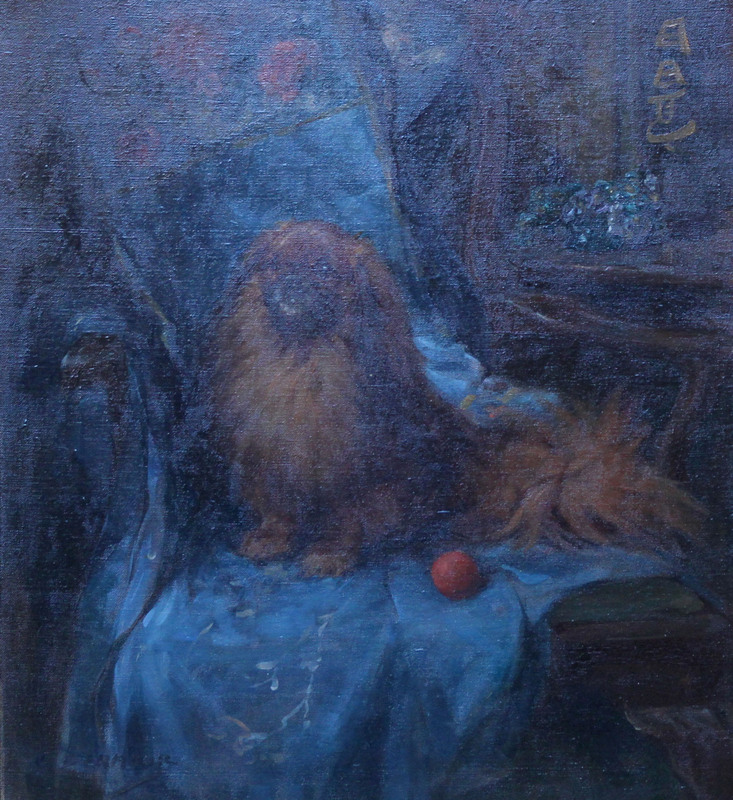 A beautiful British portrait of a Pekingese dog. 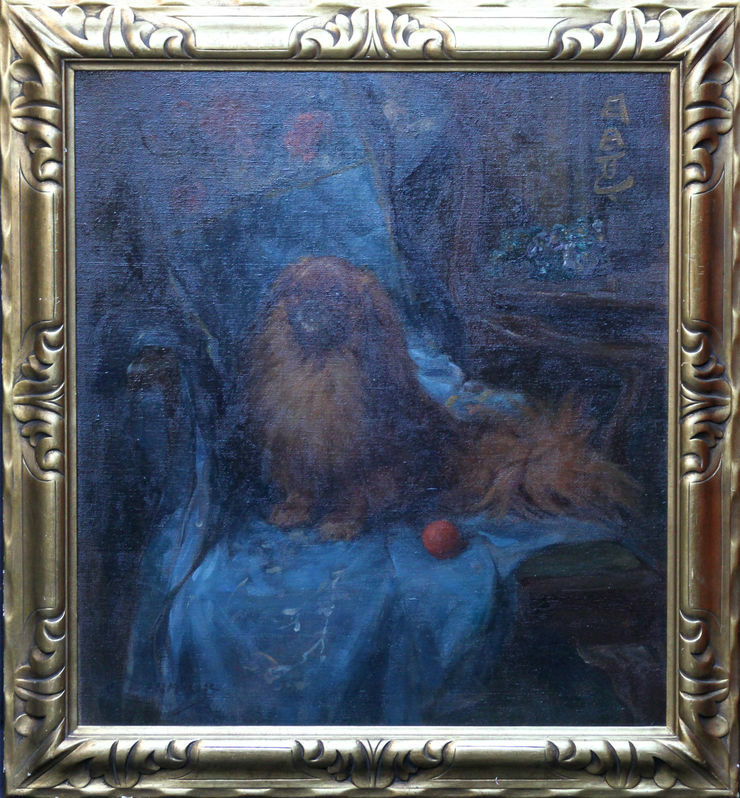 Dated to circa 1920, it is a superb Art Deco animal portrait with bold brush strokes and vibrant colour. The dogs name is, I believe, written in Japanese top right. Gilded 1930s Art Deco frame 35 inches by 32 inches. In gallery condition. George Denholm Armour (1864-1949) was a British painter. He was born in Waterside, Lanarkshire, Scotland on 30 January 1864. He grew up in Liverpool and went to school in Fife. He graduated from the University of St Andrews and the Edinburgh College of Art. He moved to Tangiers, Morocco to paint and buy horses. When his money ran out, he moved to London and shared a studio with Phil May. He met Joseph Crawhall on a hunting and painting holiday and they both ran a stud farmhouse in Wheathampstead, Hertfordshire, England. In 1898, he got married, and Crawhall was his best man at the wedding. He did illustrations for The Graphic, Punch and Country Life. In 1910, he studied military equestrianism at the Spanish Riding School in Vienna, Austria. In 1913, he became an honorary member of the Meadowbrook Polo Club. During the First World War, he commanded the remount depot in Salonika from 1917 to 1919. When his wife died in 1924, he remarried to Miss Violet Burton. They lived in Malmesbury. He became a member of the Royal Scottish Academy. He died in Wiltshire on 17 February 1949. Some of his paintings are owned by the City of Glasgow, the National Trust, the Aberdeen Art Gallery, the National Galleries of Scotland and the University of Edinburgh. His painting, A Polo Match, was sold at Christie's in 1988.